Friday night: Had the good fortune to watch one crazy storm! Pat and I went out after work for dinner and drinks, and as we were leaving the restaurant, the storm started. Niether of us thought it was going to be as bad as it was! We’d driven over to Target, and had to sit in the car for a good 10 minutes, waiting for the torrential rain and fierce thunder & lightning to stop. Poor Pat! She’s like my grandmother and my dogs…not liking the storms so much! I, of course, was taking pictures Didn’t get a lightning shot, tho, dammit! Pickity Place serves 5-course gourmet luncheons, 3 seatings a day, reservations required and has an herb garden, flower garden and gift shop; it’s also where Elizabeth Orton Jones illustrated her retelling of Little Red Riding Hood story. We saw some previews for three other movies that look awesome: The Pursuit of Happiness, featuring Will Smith; Children of Men directed by Alfonso Cuarón (he also directed Harry Potter and the Prisoner of Azkaban) and starring Julianne Moore & Clive Owen; and World Trade Center, featuring Nicolas Cage. I am SO all over that movie The Persuit of Happiness with you. That looked Fantastic. So did the others. Those last two pics of the moth and the butterfly…You are inspiring me to do more with my photography on line…Thanks for sharing! Great pics – I love the stormy ones! I want to see lady in the water- I like Night’s movies personally a fair amount. The Children of Men looks really cool, I think Paul watched the preview of that last night. I love movies like that – set in the future and all. The weekend was good, though busy. Got the Piccalilli made and then went out to the garden and had 5 more cukes to pick! What to make, what to make? Woke up to 55 degree weather this morning, how wonderful! I LOVE a good storm!!!! I SO wanted to see that “Body” exhibit in NYC….but no one wanted to go with me!!! Nooo! M. Night can’t direct Harry Potter. Ugh. I watched “Signs” for the first time a few weeks ago, and there’s just something about his style that bugs me. Hey, question. Did you like living in Norfolk/Va Beach? I was thinking that might be a relocation option. Had a great weekend, thanks! Sounds like you had a lovely one. I’ve heard about the body exhibit; I’d love to see it. And “Children of Men” looks like it could be very good. Sounds like you had a fun-filled weekend. Loved the photos of the storm! Looks like you had a really nice weekend. Mine was less eventful but very relaxing. Love the storm pics, very beautiful. Glad you enjoyed Lady, its a fun film. I’m glad this film didn’t have the big twist moment. There were some interesting revelations as to who was who in the story but no big “ta-da!! !” moment which I really enjoyed. OMG warn people when you’re posting pictures of those awful butterflies! i swear that one on the left, while beautiful, tried to attack me. through the monitor. stop laughing, it did. glad you had a good weekend despite the freaky rain friday. 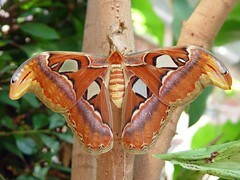 I love the sheets and I’ve always wanted to visit the butterfly farm. Cool. Sounds like a fun and spontaneous weekend. Ohhhh, storms. We haven’t had rain in forever. I miss it. And I love the pictures, all of them. After the storm is magnificent and the purple in the rainbow shot is wow. 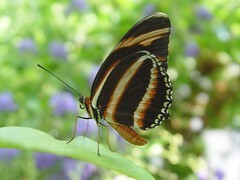 I love the pics of the butterflies. Congrats. on being chosen Michele’s site of the day! Sorry my face is red. Meant to say Michele sent me….on my way to the site of the day. I’m in love w/Wolf. That’s such a cute pic.